I’ve taught music in Cairns for over 20 years, to all ages, helping gifted children as young as 4 and mature students above 80 years of age. I teach and enjoy most styles of music from current chart hits to the classics. Above all, I love to create musicians and see natural talent developing. Most students learn purely for their own pleasure and have no intention of performing before an audience. For those that do want to take their musical ambitions further, I'm proud to say that my tuition and special musical arrangements have helped many pupils win in Eisteddfod and Music festivals. I began using computers in the early 80's. I wrote several programs including one to print notation, and a business application to keep track of my students and fees. My interest in computers has expanded to areas of Digital Imaging, Desktop Publishing and of course using Midi and Sequencing software. The Web Design page has details of affordable and effective web sites that I create. I enjoy working with complete beginners. Building a strong foundation at the start is so important that I publish my own beginners music book – ‘First Steps’ and an ‘easy play’ Christmas Carols Book. My tuition covers all the traditional tools of the musician including theory and correct technique. These are learnt, not to pass an examination, but because they are essential to us. I specialise in Keyboard tuition. The keyboard is an easy way to begin playing music with positive results. It’s versatile, enabling us to play with a variety of instruments and rhythms, which encourages the student to play more often – and the more we play, the better we get ! My keyboard tuition includes several elements of both Piano and Organ playing, in particular two handed co-ordination, so that a student can develop and eventually be able to play all types of keyboard. My best references come from my pupils who recommend me to others and keep my waiting list full. Several years experience playing ‘Top 40’ dance hits in Rock bands and also performing in light Jazz, Old Time Dance, Rock ‘n Roll and Cabaret Bands, has given me a wealth of knowledge in all area of musicianship. I write and record songs for personal pleasure and have written ‘jingles’ for TV. 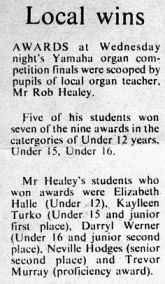 The Achievements page has some info on my students success in music competitions and a little about my personal musical experience.